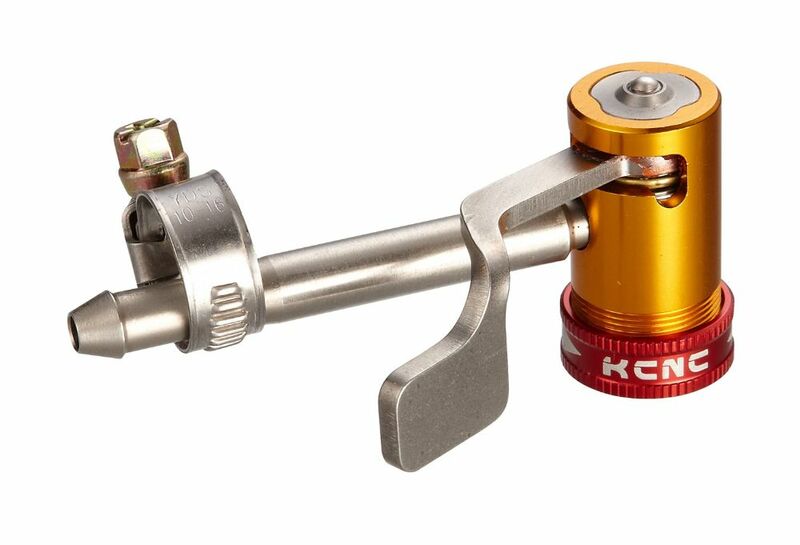 Perfect for the small apertures in disc wheels - the Pump Connector from KCNC fits track pumps and compressor air lines. The new head is shorter to fit smaller openings - just 32mm, and has a stainless lever which is more durable. Also the Open/Close lever operates over 65 degrees, rather than the 90 degs of the previous version. With a sideways clamping lever these are ideal for disc wheels with minimal access to the valve stem. Beautifully made from anodised 7075 alloy and stainless steel with stainless bearings on the clamping lever. Compressor fit is a plain 8mm stainless tube and jubilee clip.